Blockchain: a tool of the future for the energy transition ? The blockchain is first of all an instrument that constitutes a database containing the history of all the exchanges carried out between its users since its creation. As a result, it is transparent and secure and each user can check the validity of the chain. This new way of storing information is mainly used in the financial world but it could also be a new instrument for local energy governance. At a time of self-consumption of energy and the development of smart grids, the blockchain offers a new energy management system, intelligent and at the service of local actors. Distributed and secure recording and storage of energy flows, energy certification and verification, real-time monitoring and diagnosis of energy consumption, remuneration in real or virtual currency… the list of possible applications in the energy world is long. The energy blockchain is intended to encourage the production and consumption of local renewable energies, while reducing system costs for all. 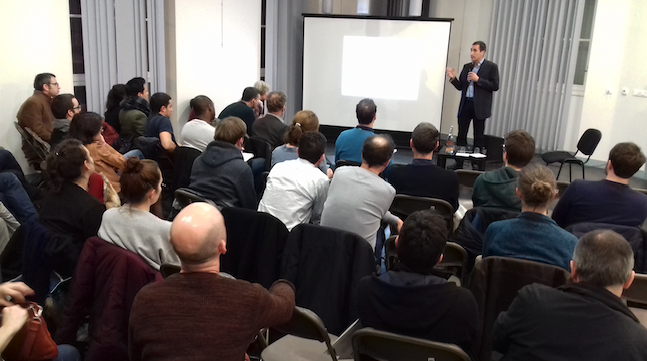 A revolution may therefore be coming to an end… In any case, this is what Pierre Paperon, Blockchain expert who came to present the instrument during the City-zen Days in Grenoble, France, predicts. The public, who came in large numbers for the event, largely supported the project.